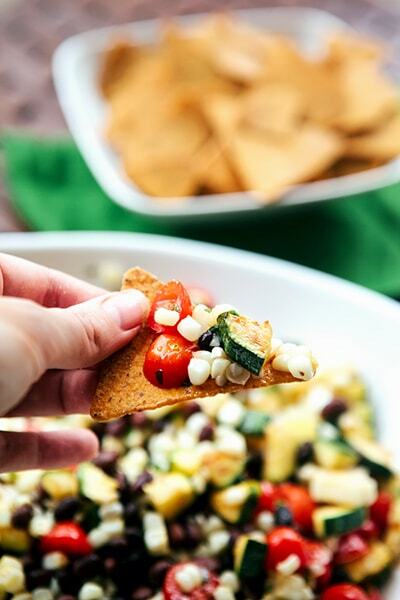 Fresh Zucchini Corn Salsa would make a great appetizer or snack, but with the added protein from the black beans, it also makes a perfect light and healthy lunch. Summer is coming to an end and school has already started here. Thanks to my backyard garden, however, I am still savoring the tastes of summer. We have a monster of a zucchini plant this year and it has showed no sign of slowing its veggie production down. We are picking one or two good sized zucchinis off the plant almost every day. I’ve had to get pretty creative in the kitchen to keep up with all the fresh produce coming off the vines. We’ve been enjoying a Roasted Corn, Zucchini, Tomato Pasta for dinner more than once a week, but at the rate this zucchini keeps popping off the vine, I need to incorporate it into lunch too! 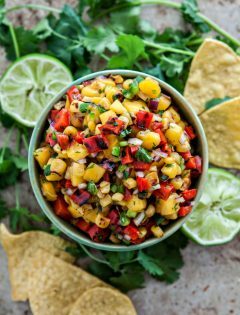 I’ve been enjoying this Fresh Zucchini Corn Salsa for lunch lately and it is a winner. 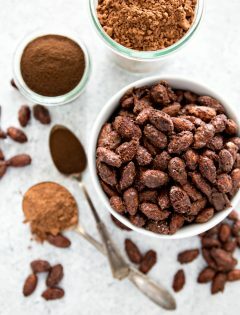 It would make a great appetizer or snack, but with the added protein from the black beans, it also makes a perfect light and healthy lunch. 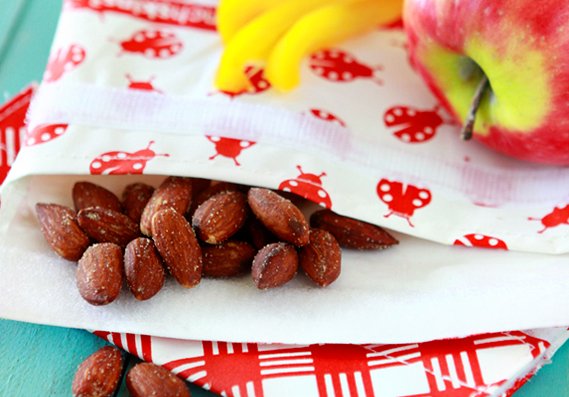 This recipe is also flexible. If you have fresh veggies in the garden or from the market, they taste great and enhance the flavor. However, this would still be quite tasty with frozen or even canned corn and tomatoes. If using corn on the cob, preheat oven to 350. Leaving corn in husks, rinse with warm water and place in oven directly on middle rack. Bake for 30 minutes, then remove and pull back husks. Cut corn off cob and set aside. While corn is cooking, heat 1 tablespoon olive oil in large skillet. Add diced zucchini and sauté until softened and lightly browned, approximately 6 to 7 minutes. In a small bowl combine parsley, vinegar, remaining olive oil, salt, and garlic. 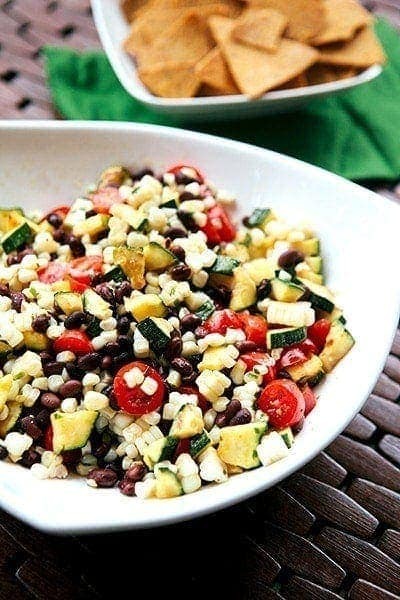 In a large bowl toss together corn, zucchini, beans, and tomatoes. Stir in vinegar mixture and coat evenly. LOVE this salsa! I’m always looking for fun recipes to use my leftover zucchinis, and this is perfect! Thanks for posting it up – great blog! 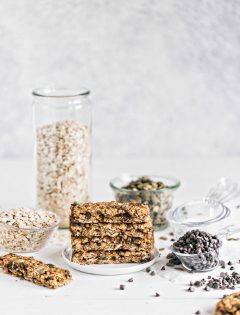 Love the recipes and photography. 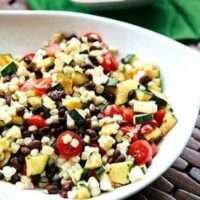 I love corn salad/salsa, but what a great ida to add zucchini, too! I’m sure the abundance of zucchini is a little love/hate; so good to have fresh zucchini, but what to DO with it all!? This salsa looks so fresh and a good way to end the summer on. This salsa looks totally perfect! Love! Love fresh summer salsa!! This looks perfect!